Last Wednesday, 30 March 2016, Hungarian Actress Marianne Krencsey died. She starred in some of the classics of the Hungarian cinema of the 1950s, like her debut film Liliomfi/Lily Boy (Karoly Makk, 1954), Bolond április/Summer Clouds (Zoltán Fábri, 1957) and Fapados szerelem/Discount love (Félix Máriássy, 1960). Marianne Krencsey stopped making films in 1966, after she left Hungary. 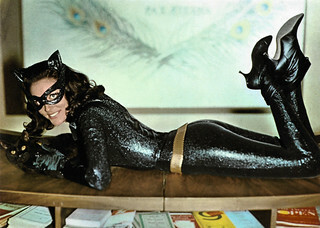 She passed away in New York, at the age of 84. East-German postcard by VEB Progress Filmvertrieb, Berlin. no. 634, 1958. Photo: Magyar-Film. Marianne Krencsey was born in Rákoscsaba (now Budapest), Hungary in 1931. Her parents were Vilmos Krencsey and Anna Lackner. Her father was from an old noble family. Krencsey attended the Peter Pázmány University and studied acting and directing. In Budapest she met director Karoly Makk who offered her the female lead role opposite Iván Darvas in his film Liliomfi/Lily Boy (1954). 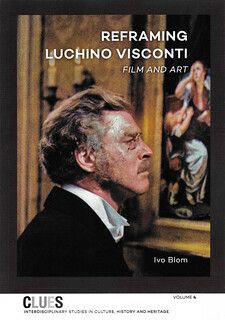 The film was show at the 1955 Cannes Film Festival, but did not win an award. She also appeared in Makk’s A 9-es kórterem/The 9-ward (Karoly Makk, 1955). Krencsey married Karoly Makk in 1957, but the couple divorced in 1960. 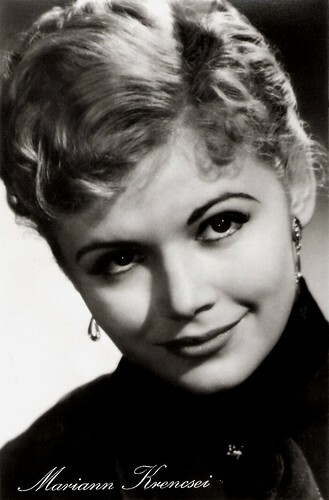 In 1955, the Hungarian Television began to make test broadcasts with her. In the following years, she also appeared in several Hungarian films including Gábor diák/The Gabor students (László Kalmár, 1956) with Ferenc Zenthe, the crime drama Két vallomás/Two Wishes (Márton Keleti, 1957) starring Mari Töröcsik, Bolond április/Summer Clouds (Zoltán Fábri, 1957), and Szegény gazdagok/Poor Rich (Frigyes Bán, 1959) with Gyula Benkö and Margit Bara. 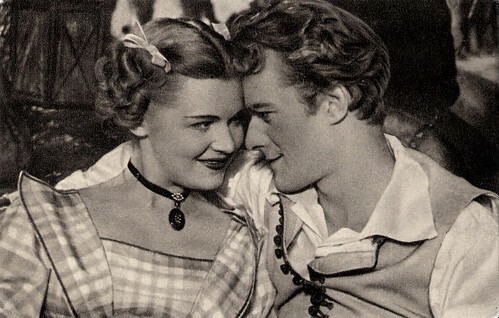 Krencsey also had a supporting part in the French-Hungarian coproduction La belle et le tzigane/The beauty and the gypsy (Jean Dréville, Márton Keleti, 1959) featuring Nicole Courcel and Gyula Buss. Hungarian postcard by Képzömüvészeti Alap Kiadóvállalata, Budapest, no. 331/9/571. Photo: Hungarofilm. 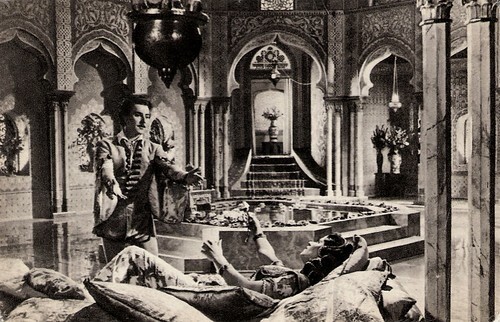 Publicity still for Liliomfi/Lily Boy (Karoly Makk, 1954) with Iván Darvas. Hungarian postcard by Képzömüvészeti Alap Kiadóvállalata, Budapest, no. 331/9/571. Photo: publicity still for Gábor diák/Gabor students (László Kalmár, 1956) with Ferenc Zenthe. Marianne Krencsey also worked as an actress and director for the theatre. She was engaged by the Kecskemét Katona József Theatre, the Comedy Theatre, the Szolnok Szigliget Theatre and the National Theatre of Pécs. In the cinema she was seen in the romantic comedy Két emelet boldogság/Two floors of happiness (János Herskó, 1960) with Edit Domján, Fapados szerelem/Discount love (Félix Máriássy, 1960), in which she was reunited with Ferenc Zenthe, and A Noszty fiú esete Tóth Marival/Young Noszty and Mary Toth (Viktor Gertler, 1960). For the first time, she appeared in an evil role in the still popular historical drama Az aranyember/The Man of Gold (Viktor Gertler, 1962). This was an adaptation of Mór Jókai's classic 19th century novel on Mihály Tímár, the captain of a commercial Danube ship in the 1830s. In 1962, Marianne Krencsey married Gyula Nemes, a doctor-gynaecologist. 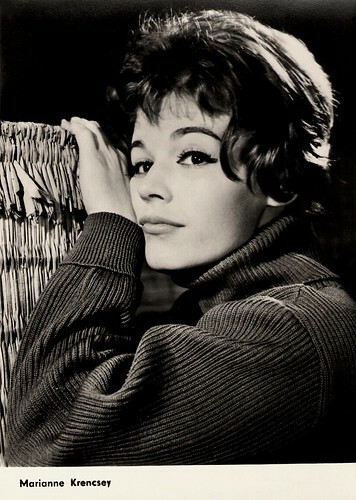 She played the female lead in Meztelen diplomata/The naked diplomat (György Palásthy, 1963) and had a small part in the international coproduction Germinal (Yves Allégret, 1963) with Jean Sorel. Her last films were A Tenkes kapitánya/The Captain from Tenkes (Tamás Fejér, 1965) and A férfi egészen más/The man is quite different (Tamás Fejér, 1966). In 1966, Marianne and her husband left Hungary for political reasons. They travelled along London and Reykjavik to the United States and settled there permanently. The former film star worked there as a bank clerk and later in her husband's doctor's office for twenty years. In 1971 the couple received US citizenship. In 2001, Marianne Krencsey published an auto-biography. She had a son, Vincent Nemes, and a grandson. East-German postcard by VEB Progress Filmvertrieb, Berlin. no. 1707, 1962. Photo: Hungarofilm. 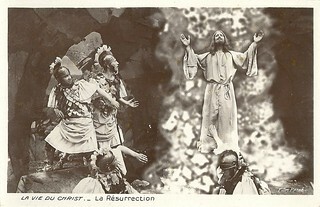 East-German postcard by VEB Progress Filmvertrieb, Berlin. no. 2622, 1966. 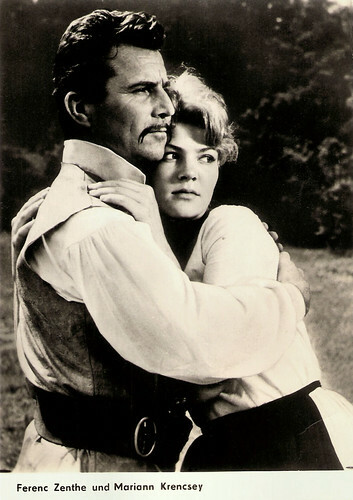 Photo: publicity still for A Tenkes kapitánya/The Captain from Tenkes (Tamás Fejér, 1965) with Ferenc Zenthe. Sources: Origo (Hungarian), Wikipedia (Hungarian), and IMDb.